THE Roche merchant family left their mark on Limerick society from the mid-eighteenth to early nineteenth century. John Roche and his wife Anne Stackpool had four sons: Stephen, Philip, John and Thomas, all of who would become independently wealthy in their own right. John Snr was described as a merchant prince. In 1755, he fitted out a huge ship, the largest of its kind ever seen in Limerick, and dispatched it to the West Indies. He had it mounted with 14 sixteen-pounder guns to fend off pirates on its hazardous journey. While his sons Stephen and Philip remained in Limerick, John continued the family business in Dublin and Thomas in Rotterdam. Stephen was the father of William Roche of Roche’s Hanging Gardens fame. John and Anne also had two daughters: Christina and Anastasia. Anastasia married another Limerick merchant, Ignatius Nihell, who was not as successful as his brother-in-laws, having lost his fortune and ending up in debtor’s prison in England in 1769. His son Philip Roche, born March 23, 1820, left his mark throughout the city, but is most well known for the Granary building on Michael Street. A contemporary remembered him as “a merchant prince and venture” and Fr. White would list him as one of the most successful businessman in southern Ireland at that time. Until recently, it was believed that Philip Roche, due to his Catholicism, was prevented from buying land in his own right, so asked a protestant friend to lease the land for the Granary. In fact, Philip Roche took out a lease for the term of 999 years on 25 March 1779 from Edmond Sexton Pery and quickly began his development of the area. He erected the Granary building in 1787. Some Limerick Catholic families such as the Arthurs and Roches were prominent in business before the Catholic Relief Act of 1778. This act allowed Catholics to inherit or purchase land. Although, it was also not unusual for any merchant, no matter their religion, to take out leases as opposed to owning plots outright. Philip had excellent vision when it came to financial investments. He was an adventurer, importer and exporter of flax, cereals and seeds, and one of the most successful business figures of his day. He used the Granary warehouse to store the provisions he traded in, which he mostly supplied to the government. Just like his father, Philip had his own trouble with hazardous trading to the West Indies. In 1792, when England was at war with Holland Philip sent out two ships from Limerick under the Dutch flag. These ships were seized and the goods valued at £15,000 were divided among the British fleet and army. Even here we can see how wealthy Philip was, trading in goods of that value when his ground rent for the St Michael’s area was just over £1 a year. Jim Kemmy wrote that Philip was a “charitable man (who) frequently gave grain to the starving people of the city.” His last will and testament give a sense of his caring for both members of his family and his wider community can be seen. He also set out a provision to repay the sum of the debts of his deceased brother Thomas. Philip Roche married Margaret Kelly and had two children, John Philip and Margaret. Philip outlived his only son by 9 years. So the Granary building was bequeathed to his extended family, the Kellys. Philip Roche was married to Margaret Kelly, the daughter of John Kelly, merchant, who erected the altar in St Mary’s Chapel in 1760. John Kelly’s son Michael was married to Christina Roche, sister of Philip Roche who was then the uncle twice of Thomas Kelly. Philip Roche also built a number of houses on Bank Place and Rutland Street. Bank Place takes its name from the Bank of Limerick, popularly known as Maunsel’s Bank, which was located at No 6 Bank Place. This bank was established in 1789 and ultimately failed in the banking crash of 1820. Philip was the uncle to the banking Roche’s, who had buildings at what is now 97 to 99 O’Connell Street. It was at the rear of these building that his nephew William built the famous Roche’s hanging gardens, which are being redeveloped at the moment. William Roche (1775-1850) was born in Limerick to Stephen Roche and his second wife Sarah O’Brien in Limerick. His mother was the heir to large estates in Rathkeale, Co. Limerick and Tuam in Galway. William and his brothers were keen financiers, he and three of his five brothers went into banking. Thomas (1768-1855) was in partnership with William in Limerick. George (1860-1846) and James (1770-1853) set up a wine exporting company from Bordeaux, France. While in France, James was imprisoned for 6 months in France during the French Revolution. After his release, James returned to Ireland and went into business with another brother Stephen in Cork. James and Stephen married the Moylan sisters of Cork. John (d.1825) and took over his father’s business in Dublin. While a final brother, Richard (d.1803) took hold orders. There were also five Roche sisters. In 1801, William and Thomas set up a bank in Charlotte’s Quay, Limerick. A few years later, they bought building on O’Connell Street, which they used as their bank as well as their homes. During the 1819-1820 National Bank Crash, they were the only bank to survive in Limerick. In 1824, they were the only bank recorded in Pigott’s Trade Directory of Limerick. In 1825, Provincial Bank acquired their establishment and in 1966, this was taken over by Allied Irish Banks. Not only was William a banker, but he was the first Catholic M.P. for Limerick. He entered government on 10 December 1832 and left 23 June 1841. He was good friends with Daniel O’Connell, who would stay with him when he was visiting Limerick. While in government, he was very vocal on issues surrounding the emancipation of the Catholics, Jews, and opposed slavery. He was a Magistrate for Limerick and the first Roman Catholic in Ireland to become a Commissioner of the Peace. During his political career, he would stay at 5 Duke Street, Westminster, London. Today we remember William Roche for his famous garden. In 1808, he built his impressive garden to the rear of his bank on O’Connell’s Street. It stretched to Henry Street and covering approximately one acre of land. The garden cost £15,000 at the time, which is the equivalent of €600,000 today. The garden sat on a series of vaulted roofed stores. The floor of the garden was flagged and cemented together, and excess water was lead out of the garden by lead pipes to prevent leakage to the stores below. The soil in some of the terraces went up to 5 foot deep. The garden was heated and cooled by a series of flues, channels, vents and windows. Due to their sturdy construction these vaults were allocated as air raid shelters during the Second World War. On top of these vaults sat a series of terraces which were connected by stairways. On the bottom terrace grew a variety of flowers. While the middle terraces were where he grew pears, apples, plums, and various types of vegetables, with a section in the centre for melons and cucumbers. The top terraces of the gardens were hot houses, conservatories and glasshouses. Here he grew grapes, pineapples, peaches and oranges. At its highest point the garden reached 70 feet above street level. These gardens were visited by almost every notable visitor to Limerick, including in 1809 Charlotte Lennox, Duchess of Richmond. William died unmarried and childless on April 27, 1850 and he did not leave instructions for the upkeep of his gardens. As a result his gardens were sold and dismantled soon after his death. 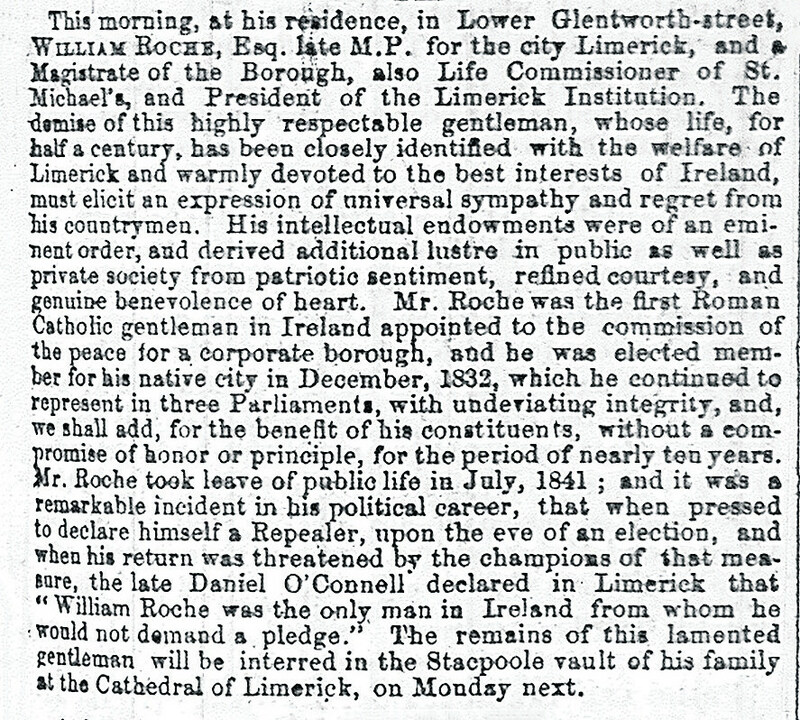 “Mr James Roche was born in Limerick some eighty three years ago, of an ancient and wealthy family. At an early period of his life, he was sent to France, and educated in the Catholic College of Saintes. After completing his studies and paying a short visit to Ireland, he settled in Bordeaux, where he became acquainted with the most distinguished leaders of the Girondists. Mr Roche was in Paris during the horrors of the first Revolution, and in 1793 was arrested there as a British subject, but was released on the death of Robespierre. The Roche family are remembered today chiefly for the Granary building, the Hanging Gardens and Roche’s Street.